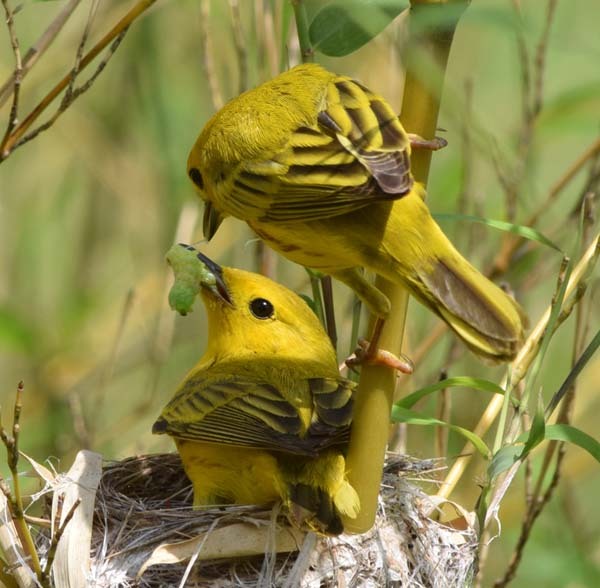 While monitoring an Acadian flycatcher nesting along the creek this year, I observed a pair of yellow warblers preparing to nest nearby in a dense multiflora rose bush. The female seemed to be lining the nest which was near completion and both adults were flitting about in the bush and nearby shrubs. 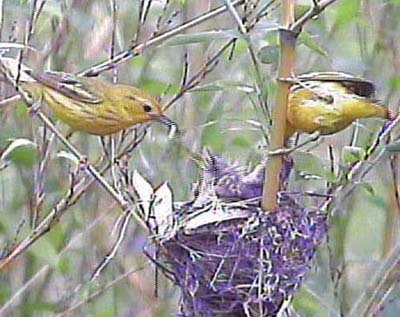 While visiting the flycatcher nest, I observed the warblers’ activity from a distance for several days. They seemed to eventually pay less attention to the completed nest and spend more time across the creek, only 10-20 meters away. This suggested that the nest might now contain a cowbird egg, but, upon later inspection, it was found to be empty. I didn’t look for their new nest across the creek because another pair were found nesting in the bamboo patch, within video cable reach of the barn. The bamboo had been planted, not as habitat, but for the poles that have so many uses around the yard. 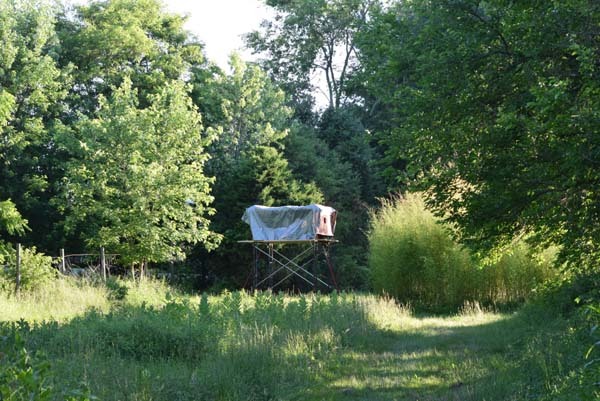 It had seemed to be of no interest to birds until two years ago when cardinals built a nest rather low in the interior of the now 12 ft high stand. 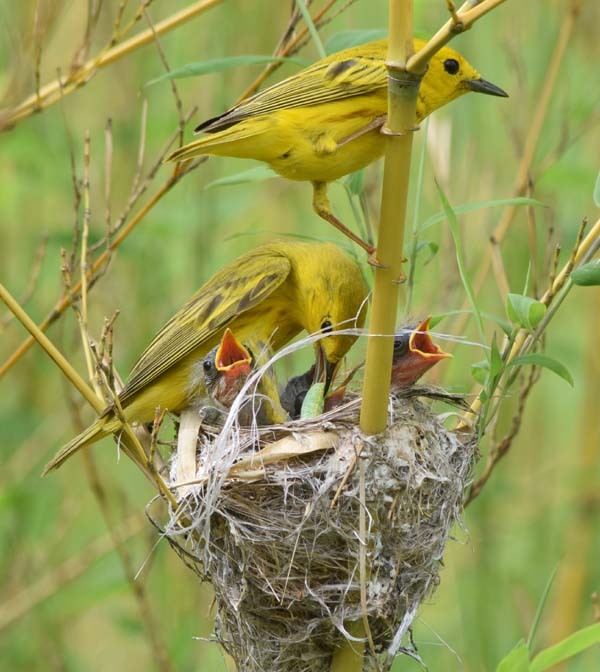 Their nest of 5 eggs was soon predated. Catbirds then built a nest only 5 feet away and just as low and successfully fledged 5 young. Last year, catbirds again nested successfully in the bamboo. 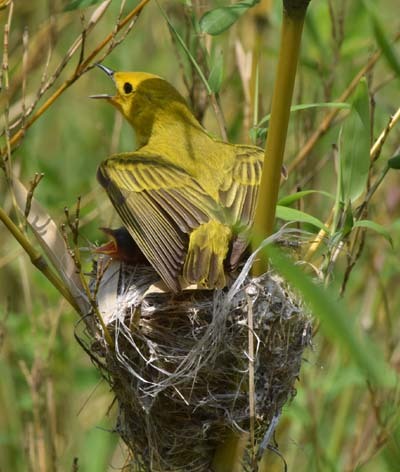 Also, a female yellow warbler was observed gathering nesting material from the sawdust pit in the barnyard and carrying it deep into the bamboo. She worked at this most of the day, but was never seen near the bamboo again and no nest was to be found. 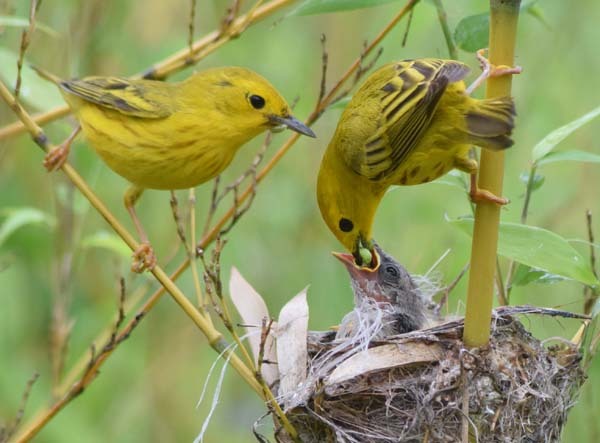 This year, a completed yellow warbler nest was found much higher and readily visible from the ground. It offered a good opportunity to both observe and videotape nesting activity from an elevated blind. 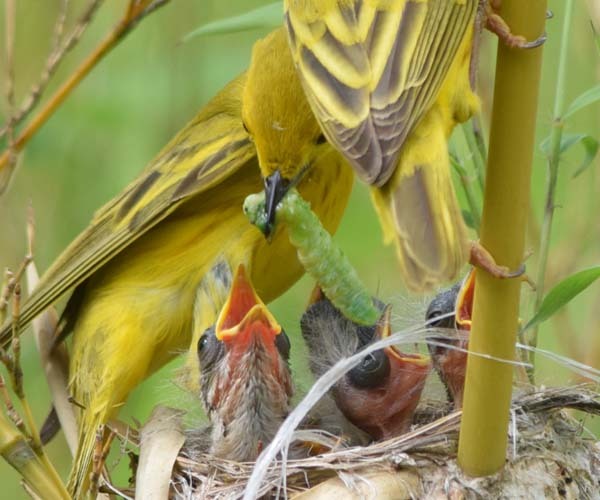 By the time the blind was erected, the female yellow warbler was brooding 4 nestlings and the male was bringing prey to the nest – usually passing it to the female who then seemed to stuff it down a nestling’s throat if it was a caterpillar. Although a variety of insects and spiders were brought, the most common prey items seen were green caterpillars with a yellow stripe on each side. These were a challenge for the nestlings to swallow even when they were “mashed” by the adults. 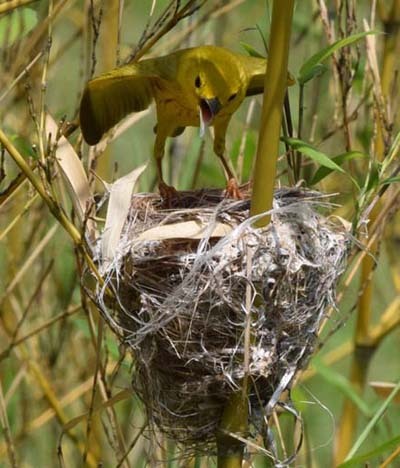 This yellow warbler nest was exposed to direct sunlight, due to the slender leaves near the top of the bamboo stems. On the several hottest days the female would spread her wings to shade the nest for long periods of time. She would sometimes perch on the rim of the nest with wings spread to shade the nestlings while allowing air to flow under her. Also, early in the nesting, a heavy rain storm with strong wind gusts seemed about to destroy the nest, or at least eject its contents, but all survived. 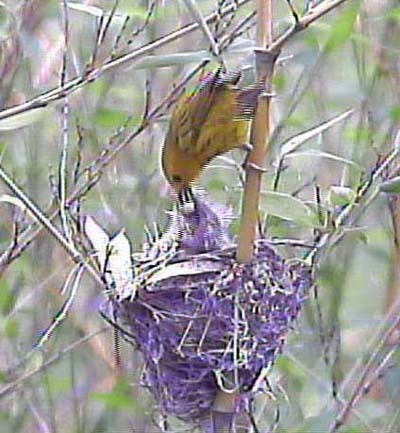 The bamboo swayed violently back and forth, moving in and out of the video monitor view, but the nest was anchored only to a single stem so it wasn’t pulled apart. However, I was surprised and relieved to find that the occupants managed to hang on. One of the four nestlings was at least one or two days younger than the other three and usually was not visible above the rim of the nest from the blind. It remained in the nest one day after the others fledged. Such asynchronous hatching happens when incubation is begun before the last egg is laid. In this case, I suspect there was a two day interval between the 3rd and 4th egg. 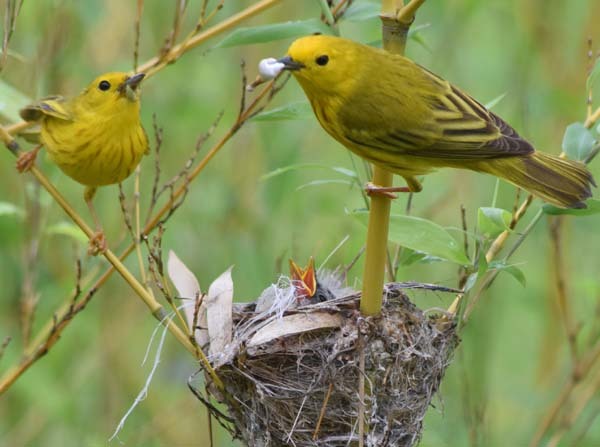 The yellow warbler is a common species in much of the U.S. and several pairs are always present on our property each spring, but this is the first active nest I have found. They frequent the several hundred feet of willows I planted along an eroding gully, but never seem to nest there. The nest built but not used in the rose was 10 yards from these willows. 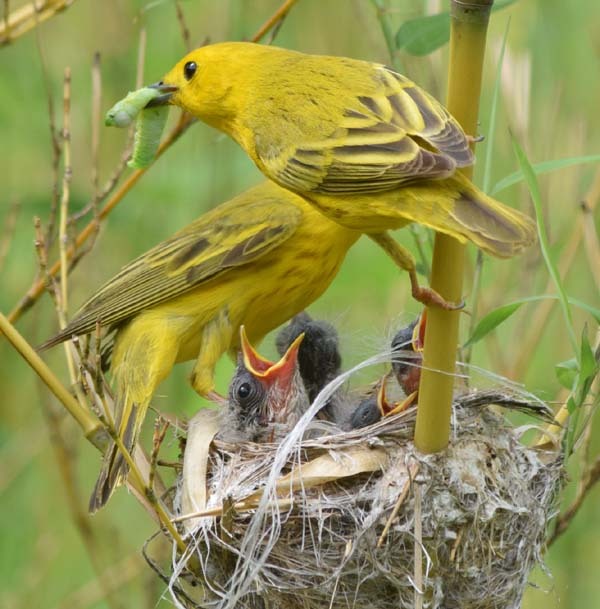 The rose would have seemed a safer location, but yellow warblers are often said to prefer willows. Maybe that is why the barnyard pair chose the similar leafed bamboo. 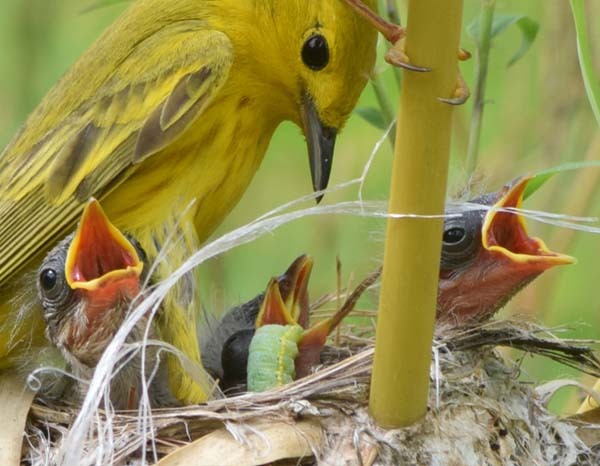 Video monitoring of the yellow warbler nest provided data on the frequency of feeding visits, but, as with the video of barn swallow nests, did not allow identification of prey species. The best way to i.d. prey still seems to be observation with a spotting scope or still photography with a telephoto lens. Yellow warbler with wings spread, shading neslings from direct sun on hot day. She would remain in this position for many minutes.